Plant-based recipes to nourish mind, body and soul. Who says hot chocolate is just for the holidays? I for one think it is now, in the throws of winter, that we most likely need this kind of sweet and simple pick-me-up! I am excited to be finally posting this recipe as it is one I have made for a few years and its a total two-for-one. First, I show you how to make a SUPER simple hot chocolate that is wildly healthy and full of chocolate flavor! This creamy hot coco is the perfect night cap on a chilly evening. I enjoy it as dessert - it keeps my sweets cravings satisfied without leaving me over-stuffed like some other sweet treats will do. You whip up this recipe in your blender and takes just minutes to make …if you don’t have a high speed blender (that gets hot) you can heat (and re-heat) the coco on your stove. This recipe makes enough for one steaming mug AND leftovers because…. I transform the extra hot cocoa into something even better (if that’s possible) by pouring it over oats and other goodies to create the BEST overnight oats you’ll ever enjoy. This oat recipe is protein packed and full of ALL the good things. I enjoy this kind of thing during a busy morning, post workout. I use hemp protein, which is a super clean source of this essential macronutrient but usually a little unenjoyable for me….yet when you mix it with hot chocolate, well, that problem goes away. I love that you can customize this recipe and make it your own - I usually throw in whatever superfood powders I have lying around, most of them (especially the more earthy flavored ones) tend to bring out the flavor of the cacao - which is a great added bonus. I also love taking one thing recipe and using it as the base for another, especially this year as I commit to less waste … this recipe lets me do that in all the best ways! Add all ingredients to a high speed blender and blend on high for 3-4 minutes or until very warm. Taste and adjust sweetness, salt or spices. You can serve warm from the blender (it should be nice and frothy) OR you can take it a step further by adding it to a small saucepan on medium heat and simmering for 5 additional minutes, or until the mixture has thickened slightly. Serve in a cozy mug and top with coconut cream (the solids from a can of regular, not lite, coconut milk mixed with a little liquid sweetener) and a sprinkle of cinnamon. *This recipe can be double and tripled, be sure to reserve 1.5 cups for the overnight protein oats. Top with 1/4 cup fresh/frozen blueberries, sliced banana, flaked coconut, nut butter, etc. The night before you want to enjoy your oats, take a clean 16 oz. mason jar and combine all of the ingredients above save the hot cocoa and toppings. Put the lid on and give the dry ingredients a shake to combine throughly. Then, add in the hot chocolate - once again put the lid on and shake til really well combined. Set in the fridge overnight. In the morning, top the jar off with any fresh additions and enjoy cold OR reheat in a sauce pan (adding additional liquid as needed, I used about 1/2 cup almond milk). Serve in a bowl or eat it right out of the jar! Tastes like dessert but eats like breakfast? I am so in love with this part-cobbler part-parfait and I think you will be too. It comes together in a few easy steps and once prepped, it assembles in mere minutes. It just screams 'summer is almost here' with a combo of ruby-red compote, fresh zingy yogurt and chewy-crunchy raw-nola -granolas raw (and totally addictive) cousin. When summer starts to roll around I star to crave something lighter than my usual oats for breakfast, but right now, we're in that silly in-between-time when it's still too cold for an AM smoothie. Sometimes I go for a simple bowl of fruit, but lately, THIS has been my go-to - I still get my fiber-rich oats and I get to enjoy a whole slew of other delicious gut-friendly stuff too! Rhubarb is only around for a few short weeks in my area so I am make sure to take advantage of it while it's here. A powerful digestive aid that is loaded with vitamins and minerals, I pair this veggie with it's classic counterpart - the strawberry, which are just coming into season. My compote sets itself apart slightly with perfume of rose water (which can be found here) and chia seeds - which help to naturally thicken the sauce as it cools. I am so excited for you to scroll below and check out my raw-nola recipe. It creates the 'crumble' of this 'cobbler' but it requires no oven and it's super easy, quick and totally customizable. I simply add all my favorite dried fruits, nuts, seeds, seasonings and oats to a blender - pulse a few times and voila! Let me know if you make this for dessert...err...I mean, breakfast! :) Enjoy! *Prep ingredients for a full week and assemble your parfaits day of! Also makes an excellent brunch item to share! Add chopped rhubarb and berries along with a little bit of water into a small saucepan on medium heat. Allow the ingredients to cook down together, it will happen rather quickly. If the bottom of the pan dries out before the ingredients soften, add a bit more water, a little at a time. Once the rhubarb breaks down and the mixture appears quite liquid turn off the stove and remove from the heat. Allow the pan to cool slightly and then stir in sweetener to taste, chia seeds and rose water. Serve warm or transfer to an airtight container to chill in the fridge - keep in mind the pectin in the berries and the fiber in the chia will allow the compote to thicken as it cools! Keeps for 4-5 days - also great on toast, on top of oatmeal or enjoyed warm over waffles. Add your pitted dates and stemmed figs to a food processor along with the larger nuts and half of your oats - pulse until the dates, figs and nuts are fully broken up and appear 'granola' like in texture and size. Add in the rest of the oats as well as all other ingredients and pulse just to combine. Mixture should appear crumbly, but it will pull together when pressed between your fingers. Taste for seasoning and adjust. Store in an air tight container - keeps for weeks in the fridge! Also great eaten alone as a snack or on top of a smoothie bowl! Instructions here (keep in mind this needs a few days to ferment). If your making this dish day of, use a store bought alternative - my favorite is LAVVA brand but Kite Hill, CoYo and So Delicious also make good, easy-to-find dairy-free alternatives. You could also serve up some chia seed pudding as this layer of your parfait to take the yogurt out of the mix. TIP: Dairy-free yogurts don't have the protein content that conventional yogurts do - to add in some more power, I have often mixed my dairy-free yogurt with a tbsp. of two of vanilla protein powder - in addition to the added nutrition, it also helps to thicken the yogurt substantially for more of a 'greek yogurt' consistency. Layer apx. two inches of your cooled compote at the bottom of a jar, cup or other glass vessel. Then add in apx. 2 inches of rawnola and top with apx. 2 inches of plant-based yogurt or chia seed pudding. Add fresh berries or other fruit on top and sprinkle with a bit more rawnola for garnish. Pro Tip: The rawnola can get a little bit soggy if you let these guys sit too long, which I don't mind because its so full of fun textures but for best results layer these up right before serving! Light, fluffy, moist and just the slightest bit sweet. A double entendre of sorts - a tea cake, made of good-for-you green tea! This traditional Brit-inspired springy, spongey cake is perfect with your 'cuppa' - enjoyed morning, noon, or night and it get's it special texture from a super unique ingredient! The thinnest layer of chocolate ganache and earthy green tea make the flavor profile light, earthy and refreshing. This is the vegan cake for people who don't like vegan cake. For people like my dad - who usually has an initially adverse reaction to anything I bake. He often takes a bite and says "it's nice, but you can tell it's vegan. ", to which I usually reply, "good! "...I mean, that's kinda the point. But I know what he means, vegan baked goods tend be to slightly dense and more moist due to the omission of eggs. But, no sir, not this cake! This cake is light and fluffy and rises pretty high thanks to the use of baking soda, baking powder, self rising flour AND whipped aquafaba - the magical liquid found in your lowly can of chic peas. If you want to know more about this wonder-liquid, just give it a quick google - truly fascinating stuff that mimics the addition of whipped egg whites in a traditional sponge cake. I know I said it above but I LOVE the addition of matcha here - not only for what it adds in color and flavor but for the clean boost of energy this superfood provides. Paired with coconut and vanilla extract and the light, spongey texture this cake is truly something unique that will impress vegans and non-vegans alike! My mom and I had a similar dessert served to us on a recent trip to Mexico and I was blown away by the fact that a vegan cake could get so light and spongey so I set out to recreate it, first by doing a ton of research. The final recipe I settled on was a mash up of two or three I found online and it is simple, quick and totally do-able even for a novice vegan baker. PLUS I only had to test it once to get the perfect result so the measurements and method is pretty fool proof - be sure to use self rising flour or it will not turn out the same! You can of course leave off the chocolate ganache but I do love the extra sweetness it gives this delicate cake. It would be interesting to omit the green tea powder from the recipe, opting for a different flavor instead - perhaps raspberry, cacao or chai spice! I also could see this batter working well as cupcakes - just be sure to cut your cooking time by half to start. A clean boost of energy. A less jitter effect compared to coffee. Want to know more about the benefits of matcha before you invest in this somewhat-pricey superfood? Read on, here! In a large bowl, combine the coconut yogurt, sugar, baking soda and baking powder - whisk to combine. Allow to sit for 5-10 minutes until small bubbles start to form. In the meantime, drain a can of chick peas and use an electric whisk to beat the canned liquid til it forms soft, white peaks (be patient, this can take 5-10 minutes). Once you see small bubbles in the yogurt mixture, whisk in the oil, vanilla, coconut extract, matcha and salt until well combined. Then sift in the flour. Fold it gently into the wet ingredients using a rubber spatula - do not over mix. The batter should be somewhat stiff. Take 1/2 cup of the aquafaba and fold it into the batter - the aquafaba will deflate some as you do this, but again, do not over mix. Transfer the batter to a parchment-lined, well-oiled oven-safe pan or tin (I used a 6x9" glass dish). Spread evenly across the bottom of the pan - note it may seem a bit flat now but don't worry, the cake rises quite a bit. Bake for 25 minutes, turning the pan halfway through. Test for doneness using a toothpick - if it comes out clean the cake is ready - if it does not, bake for 5-10 minutes more. Once done, take the cake out of the oven and transfer it to a wire cooling rack. To make the ganache - melt all of the ingredients listed above together in a small sauce pan (oven low heat) or in the microwave - stirring frequently. The recipe makes far more ganache than you need to garnish the cake but it's a good thing to have on hand to up-level your fruit, ice cream or morning crepes - store in your fridge and re-heat gently anytime you need a little chocolate love. Allow the cake to cool almost fully before pouring the ganache over in a very thin, even layer. Serve the cake at room temperature.. Garnish with a sprinkle of matcha powder or a dollop of coconut whipped cream. Wonderful with a cup of green tea! I started making sweet potatoes for breakfast when I put myself on a week long grain-free challenge last winter. It left me feeling lighter, more alert and fully satisfyed so I wanted to share my favorite grain-free brekky with you! Now, I LOVE oatmeal and I eat it nearly every day for breakfast. I've always eaten it and I never get sick of the stuff. So needless to say, giving up my breakfast staple was my biggest concern while taking this break from grains. But, I found that I felt GREAT without it and this sweet, nourishing whole-food alternative was just as delicious, satisfying and maybe even more filling. Along with feeling better, my week long grain-free experiment reminded me about the value of meal prepping. This recipe is SO convenient if you simply take the time to prep ahead (step-by-step directions below). Now, every 7 days or so, I cook off a batch of 6-8 sweet potatoes to enough throughout the week. This ensures that I have ready-to-eat whole-plant-foods on hand so I make better choices instead of going for the processed alternative. It's worth mentioning that as a whole-foods plant-based vegan, sweet potatoes are one of my staple foods, I have them at least a couple times a week but I never really thought about them for breakfast until recently. Sweet potatoes are a carbohydrate (read: energy) rich food that is high in pre-biotic fiber (especially in the skin), they're lower than regular potatoes on the glycemic scale and contain a ton of vitamins and minerals like beta carotene, vitamin C, manganese, copper, pantothenic acid, vitamin B6, potassium, dietary fiber, niacin, vitamin B1, vitamin B2 and phosphorus. When you top these golden beauties with a balanced ratio of fats, proteins and other micronutrients (from nuts, seeds and fruit) it's easy to see how this could be your healthiest meal of the day - but, don't forget to eat your greens though! I love how the cinnamon, nut butter and fruit play together flavor-wise - making this taste more like a sweet potato pie than anything else. So good! PRO TIP: Make sure you add just the teeniest sprinkle of salt to your potato when adding your toppings - it will take the flavors to NEW heights! If you're meal prepping/bulk cooking, start the night before by cooking your sweet potatoes so you have an easy morning routine - wash, dry and poke the skin of 4-6 large sweet potatoes with a fork. Place them on a parchment lined baking sheet in a preheated 425*F oven for 45 minutes to 1 hour. Once tender, remove from the oven and allow to cool on top of the stove. After that, you can store them in the fridge for up to one week. In the morning, you can enjoy the potato cold, at room temp but I would recommend preheating your sweet potato in the oven (10-15 minutes at 350*F does the trick) or in the microwave (2-3 min on high), if you use one. Slice the potato open length-wise and place in a shallow bowl or on a large plate - spread the nut butter over both sides and allow it to melt slightly with the heat of the potato. Add the rest of your toppings/spices in whichever order you so choose. Enjoy immediately or wrap it in tin foil as a nourishing on-the-go breakfast/lunch/dinner - and don't forget to eat the skin! Just in time for Spring! I love having something warm and nourishing in the morning and nothing is more nourishing than...cake. But really though, carrot cake is my jam. I would eat it for breakfast if I could (I even made a muffin recipe so that it wouldn't seem so crazy) but this oatmeal bowl miiiight actually be closer to the real thing. It's chock full of all the good stuff - raisins, carrot, pineapple, coconut and I even include a cashew cream cheese recipe below if you want to take it over the top. Healthy, filling and absolutely indulgent - enjoy this breakfast anytime of year. P.S - I have an insane overnight version of this recipe in my Make-Ahead-Mornings Breakfast e-book - download it for FREE today by entering your email at the top of the site! In a small sauce pan begin heating the milk on medium as you peel and grate your carrots (one very large carrot was enough). Add the oats, carrots, raisins, pineapple, coconut sugar and spices to the simmering milk and stir frequently, cooking until the carrot is soft and tender and the oats have absorbed most of the liquid - apx. 5 minutes. f you like your oats more runny add more liquid. 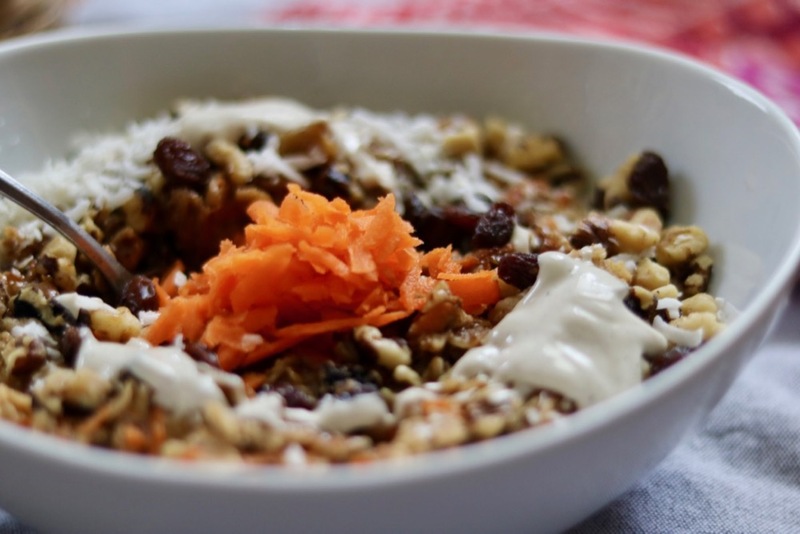 Transfer the oats to a bowl and top with walnuts, more raisins, coconut and the reserved raw grated carrot. You can also add more cinnamon, coconut sugar or more pineapple. To take it over the top, blend up some cashew cream cheese icing (method below)! To make the cashew cream cheese icing, add all ingredients to a blender and blend for at least one minute on high. The mixture should be totally smooth and pretty runny. There will be plenty left over (you need to make a reasonable amount in order for it to blend properly) but you can use it as you would a sweetened cream cheese on toast, bagels or any pastry. It stores in the fridge for a few days and thickens up a bit so it should get to a spreadable consistency using these ratios after sitting overnight. Lets address the elephant in the room right off the bat - Yes. This is a "healthy" pancake recipe. Yes, this recipe includes spinach, matcha powder and apple cider vinegar. Yes, I said spinach and NO you can't taste it. I promise. So if you are looking for a healthy, high powered meal to start your day or fill you up post workout, then you have found your new, very green, best friend. It is no coincidence that I am posting this so close to St. Pattys day. I've had pancakes on the brain lately (can you tell I miss my job making breakfast for guests every morning). I was thinking about different combinations of flavors, different textures, different colors and that's when it hit me - last year I made an incredibly healthy and nearly spot-on version of a 'Shamrock Shake' and this year (check that out, btw) so this year I wanted to bring a little health to another tasty treat. Not that green pancakes are a St. Pattys day thing but hey - you only live once and if you want to start this often indulgent holiday off right, this is your recipe! Don't let the look of these guys scare you, the whole process is honestly SO EASY and in terms of equipment all you need is a blender and a skillet. It's basically a riff on my old standby gluten-free 'blender' pancakes but with a few modifications to make it more fun, festive, high-powered and well...green. I start by adding matcha powder and spinach to create the green color and to give you an extra boost (matcha is green tea powder loaded with clean caffeine) and some extra minerals (spinach has them all). And again, I promise you CANNOT taste the spinach - the earthy matcha, vanilla protein powder and sweet coconut completely mask it's flavor. These are really good, pure and simple. Combine all wet and dry ingredients in a high speed blender and process on high til the batter is totally smooth. Allow the batter to sit and thicken for 1-2 minutes as you heat a non-stick skillet on medium heat. Pour apx. 1/3 cup of the batter into the skillet and use the back of a spoon to help spread the batter into a circular shape (it will be a little thick so the spoon does help). Cook on the first side on medium heat for apx. 1.5 minutes or until you see a few bubbles and the edges look done. Spray a spatula with a light coating of coconut oil spray and flip the pancake - cook on the other side for apx. 45 seconds to one minute until the pancake puffs up slightly and is golden brown on both sides. NOTE: With this recipe, I cook one or two pancakes at a time. If your skillet is huge and you have good control of your stoves heat, by all means make more but I find that slow and steady wins the race with these bad boys - you can always keep your oven warm and stick them in there on a sheet tray so they don't get cold. So, I am no ayurvedic expert but the ancient sister science to yoga is something that has been of deep interest to me for a long time. I first became aware of ayurveda through my mother by way of THE Deepak Chopra - I remember taking a dosha quiz and reading about my dominant constitution when I was still in middle school - it was so spot on and that had always stuck with me. When I began my yoga teacher training at Kripalu years later I had no idea we would spend so much time on ayurveda and the ideas around living a yogic lifestyle but again I was pleased to learn as much as I could (except for the part I watched my teacher scrape her own tongue in from of 50 people, that was kinda weird). Then again, while working at YogaWorks in Los Angeles I was exposed to other aspects of ayurveda as a good friend was going through an intensive training. It is one of those things that I soak up like a sponge - I always tune in when it comes up because it is just fun for me to know about (kinda like the Revolutionary War and Ancient Aliens but those are topics for another day). Now, I do not by any means obey all the ayurvedic principles all the time - I don't eat much oil (recommended to dampen my constitutions' airy qualities), I seldom dry brush or practice self massage and I don't always rise before the sun (thanks a lot, daylight savings) BUT I when I do apply ayurvedic practices, I notice that the yogic high I experience on the mat begins to seep into my daily life - routine becomes ritual, self care becomes sacred and food becomes nourishment. I love how ayurveda lets me slow down and truly recognize all the mundane 'life stuff' for the gift that it is. For the past few months the ayurvedic practice of panchakarma (a fivefold detoxification treatment involving massage, herbal therapy, and other procedures) has been popping up for me over and over again. "Panchakarma is a Sanskrit word that means “five actions” or “five treatments”. It is a process used to clean the body of toxic materials left by disease and poor nutrition". A true panchakarma is a serious (read: expensive) thing and involves a ton of highly involved treatments like, um, oil-enemas (which I'm not hating on at all, I'd totally do it, but ya know $$$). By very principal, panchakarma is to be performed away from the home over a week or more under the supervision and care of more than one ayurvedic practitioner, but, as they say "ain't nobody got time for that" so I decided to create my own toned-down ayurvedic cleanse inspired by some of the principles outlined in this ancient practice. Albeit intensive, I love the idea that I can make my own ayurvedic cleanse not about full-on withdrawal from daily life. Believe me, I am all for a good juice detox every now and again (heck I even wrote a book on it, which you can find here) but this type of mono-food cleansing sounded do-able and heck, even enjoyable to me this time around. It's approachable and because you can do a lot of meal prep it's easy to do without full on retreat from life. I love that when performing the practices I outline below, I am integrating them into my day-to-day life which hopefully will transform into a deeper awareness around self care. I was inspired to this at-home mini panchakarma as a counterweight against the uprootedness I have felt over the past few months - packing up, moving and traveling across the country, then relocating back to my hometown with a 'way-to-flexible-for-my-liking type of plan'. To be honest, it has not been an easy transition leaving remote Northern California and trying to integrate back into busy tri-state life and I really did not expect the ...ahem, feelings I'd be having. Not to mention, I have a strange uneasiness about spring - most people welcome the change but for me it has always brought on a little bit of anxiety (similar to the feeling others get around winter equinox). Anyway, it's safe to say I am so ready for a detoxifying, nourishing, grounding, cleansing pause from all of the emotional and physical stress I've taken on. It's totally customizable - this goes along with kitchiri being tri-doshic, you can customize each serving with different fruits, vegetables, chutneys or nut butters to make it savory, sweet, light or filling. The spice mixture featured in most kitchiri includes brown mustard seed, turmeric, mineral salt, cumin seed, ginger, asafoetida and fenugreek which are all great at aiding in digestion thus helping to get the body back in a balanced rhythm. You can go as light or as heavy with the spices as you wish but don't worry, it isn't spicy but rather full of flavor and actually slightly bitter. But be warned - due to the golden glow of turmeric (which is great for fighting inflammation) you need to be careful that you don't wind up with yellow-stained everything like me (sorry wooden spoon, sorry fingers). You can of course buy these spices separately, toast them and grind them but I like to take the shortcut with the package from Banyan - it's 97% organic and really tasty. Spring, ayurvedicly speaking, is kapha season (think heavy, cool, dense and wet) and winter is vata (think airy, cool and dry) so balancing those two energies -especially with three NorEasters to deal with - will be a challenge - that's where your kitchiri additions come in. As an ideal, all three doshas (vata, kapha and pita) are somewhat balanced in the body - in a state of flux just like the seasons, but equal overall. In order bring our equalize our doshas we can focus on certain practices to bring out one quality or another and eat certain foods to suppress others. First you need to center in and listen - see what types of ailments or discomforts are coming up for you before you do your research to see what your body may need. I think ayurveda has hit the nail on the head in that it considers elimination (poop, yes, poop) to be the ultimate testament to health - if we are not eliminating properly, how can we expect anything else to ...ahem, flow? Here's a short little breakdown of additions you can make to increase your personal agne (or inner fike aka digestion) and pacify any dominant dosha. If you want to dive deeper, check out this link. A FEW THINGS TO NOTE: I am vegan - which means I do not use animal products of any kind. Traditionally, kitchiri can be started with ghee (or clarified butter) OR oil. Now, while ghee is recommended for balancing my vata energy, I choose coconut oil in lue of the animal based product. If you know me, you know I avoid oil all together but I do think its important add it in this particular instance. The ghee thing however is just a principal of mine that I will not compromise so the recipe below reflects that. Also note, Vata's should use a 'warmer' oil such as sesame but I can't stand the taste of the stuff so....coconut it is. I wanted to keep this cleanse very simple, I essentially used the basic recipe on the back of Banyan Botanicals Kitchiri Spice Blend - adding only a few additional ingredients as this is meant to be a break for your digestion. 1. Soak the brown rice and mung beans for 15 minutes in a large bowl, rinse well. 2. In a large pot, melt the coconut oil on medium heat and add in the kitichiri spices - toasting them gently for a minute or two. 3. Then add in the rice and beans - gently toast for a minute more before adding the water and seaweed. Stir well. 4. Bring the mixture to a boil and then reduce to a simmer and cook for 45 minutes or until the rice is tender and the mung beans have all but disappeared. NOTE: Depending on your desired consistency, and taking into account that the mixture will continue to thicken, you may wish to add more liquid once you have removed the pot from the heat. I added apx. 2 cups more water as I like a consistency that is similar to a thin stew. 5. Store in an airtight container in the fridge and scoop out your desired portion to reheat at all of your meals - adding toppings as desired. NOTE: If you are planning on doing your own cleanse, do your research and make it your own. This is all about filling your well so you can show up better for others and it's important that you choose the aspects that best serve you. Are you interested in ayurvedic cleansing? Will you do this on your own? Would you want to do one as a group together over the spring equinox complete with recipe guide and facebook group? Let me know in the comments below! I am back! Moving across the country and diving back into 'reality' head first has proven to be very different and much more exhausting than my idealistic mind had dreamed of. It has always been my goal to be honest and real here on LCK, so while I am still in the throws of finding my way I ask for your support, understanding and patience as I might be at a 'slower roll' than usual with recipes, inspiration and more. Now that that's out of the way I really am excited to share this recipe with you because i have been dreaming of testing and posting it for the last month! I developed this energizing breakfast based off a dish I had at a cute little cafe in Santa Fe, NM on our way across the U.S last month. I LOVED the nutrient profile and unique flavor combination but wanted to make it my own with coconut milk and cardamom - so here is my take. 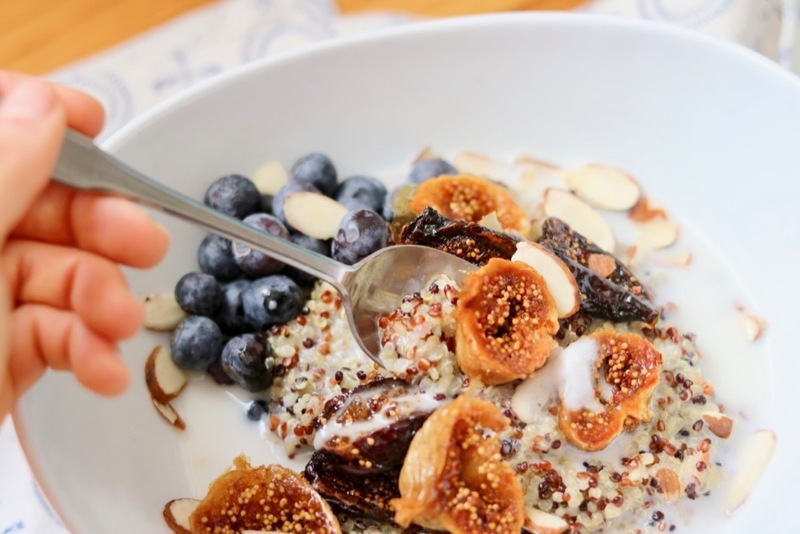 I cook protein loaded quinoa with creamy, sweet coconut milk and spices to create a warm, nourishing base to nestle sweet and plump roasted figs, antioxidant rich berries and crunchy toasted nuts. This is all topped with tangy coconut yogurt that balances the flavors perfectly. As with all my breakfast meals I look for a balanced ratio of proteins, carbohydrates and healthy fats because that will leave you feeling fully satisfied and ready to start your day. A bowl like this gives you sustained energy, a boost of protein and a kick of micronutrients and it's great for mornings where you want something slightly more elevated than your old breakfast standards -oats, cereal, granola, avo toast, pancakes. Yes, roasting figs make be a little 'extra' and it may take a bit more time but trust me, it's so very worth it. As always, let me know how you customize this recipe - it's so easy to top it with whatever you're craving and I can imagine any number of things would be amazing piled atop this creamy quinoa porridge - raspberries, coconut flakes, goji berries, etc. NOTE: If you're in a colder climate, the fat solids and liquid from the coconut milk will be separate in the can. You'll need an homogenous mixture for this recipe - simply pour the entire contents of the can into a small pot and simmer on medium heat while using a whisk or fork to combine. Once combined, pour the mixture into a storage vessel, measure out your required amount and use the rest to pour over the porridge or in a smoothie or over granola! Preheat your oven to 375*F. Add quinoa, coconut milk, maple syrup, cardamom and salt to a small pot off the heat and stir to combine. Simmer on medium heat for about 15 minutes or until the quinoa is tender and fragrant, stirring every few minutes. The quinoa should absorb most of the coconut milk without being overly dry, if it dried out too soon, add more liquid. While the quinoa is cooking, remove the stems from the dried figs and slice them in half so that the seeds are exposed. You can also use fresh figs if they are in season although the roasting time will be longer. Add the figs to a silpat or parchment lined baking sheet. Massage them with coconut oil and maple syrup and cook in the over for 10-12 minutes until they are plump, fragrant and caramelized. NOTE: Allow the figs cool for at least 5 minutes before plating so the sugars have a chance to harden, otherwise they might have a "tacky" texture. Add the cooked quinoa into two bowls and top with the roasted figs and all other desired toppings. I am in a self admitted breakfast rut. I eat the same oatmeal dish almost everyday - and honestly, I love it, but that doesn't mean I shouldn't give new things a try. Recently I was cleaning out my freezer and found some beautiful peaches and berries which inspired the base of this recipe. It's the perfect fresh take on breakfast for those mornings where you can to take a little more time to sip your coffee, cuddle with your partner or pet and smell the fragrant scent of this dish baking slowly in the oven. The warm fruit enveloped in a spicy, sweet crumble is sure to fill you up with what you need to conquer the day. 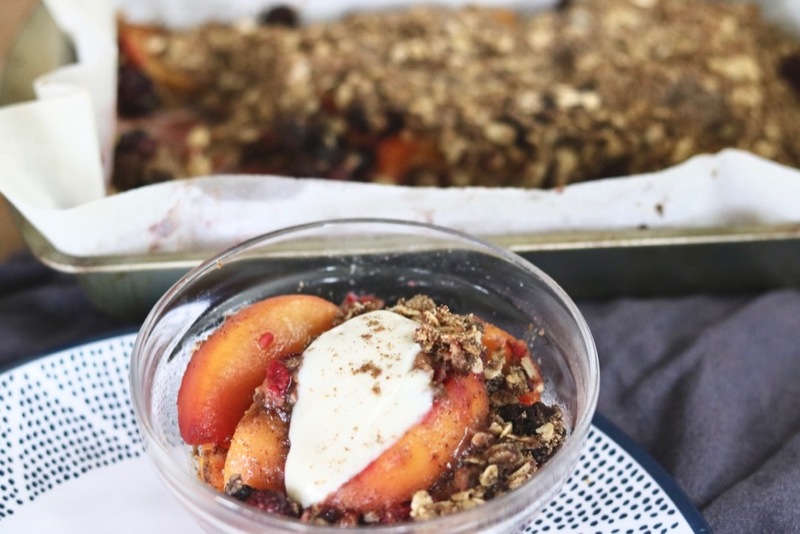 The slow roasting of berries and peaches allows them to slowly create a naturally sweet syrup that blends perfectly with the deliciously healthy crumble topping. The hints of ginger, vanilla and cardamom add to the addictive nature of this nourishing breakfast and will leave you dreaming of all the different fruit combinations that would be lovely here. While crumbles are usually a dessert item, I worked hard to ensure that the topping was both as healthy and delicious as it could be - nutty, gluten free buckwheat flour, hearty oats, low glycemic coconut sugar, and rich almond flour. I love this dish because it makes me slow down and truly enjoy - I hope it does the same for you. NOTE: Obviously the fruit combination above is just a suggestion. You can use any combination of your favorite fruits - fresh or frozen. I used frozen fruit in this particular recipe so the baking time suggestions below are relative to the temperature and type of fruit you choose but it would be a great way to use up fresh fruit that is starting to go off. Just keep an eye on it after the 20 minute mark and you should be all good! 2. Prepare your fruit - if frozen, remove from the freeze and allow to defrost for a few minutes. If fresh, dice into even sized pieces if nessesary. 3. In a shallow glass baking dish, combine your fruit and sprinkle over the grated ginger - toss well. 4. In a medium sized bowl combine all of the topping ingredients using your fingers to fully incorporate the solid coconut oil - the mixture should have the consistency of wet sand. 5. Press the crumble over the fruit, packing it down slightly so that it settles into the nooks and crannies. 6. Pop the dish into the oven and bake for 30-40 minutes or until the crust is golden brown and the fruit below is soft and juicy. 7. Allow to cool slighly before spooning into bowls and topping with whatever you so choose - my favorite is a little vanilla soy yogurt. Does the smell of fresh oranges remind anyone else of the holidays? Growing up my mom...I mean, Santa, would always top our stocking with a fresh, juicy orange, and we had to eat it before we could open any gifts. That unmistakable citrusy scent takes me directly to Christmas morning, especially when paired with sweet spices like vanilla and cardamom. So when planning recipes for the holidays I knew orange had to be involved... but I wanted it to be something totally unique. Now, I make your standard, pour-and-go granola at home pretty often - it's cheaper than store bought, super quick and I can make any flavor I want. But when I recently went make a fresh batch I realized I haven't EVER made a granola bar recipe on the blog! That had to change. While regular granola is great for a quick breakfast or snack these are even more on-the-go efficient and better for gifting (food makes the best gifts, right?). 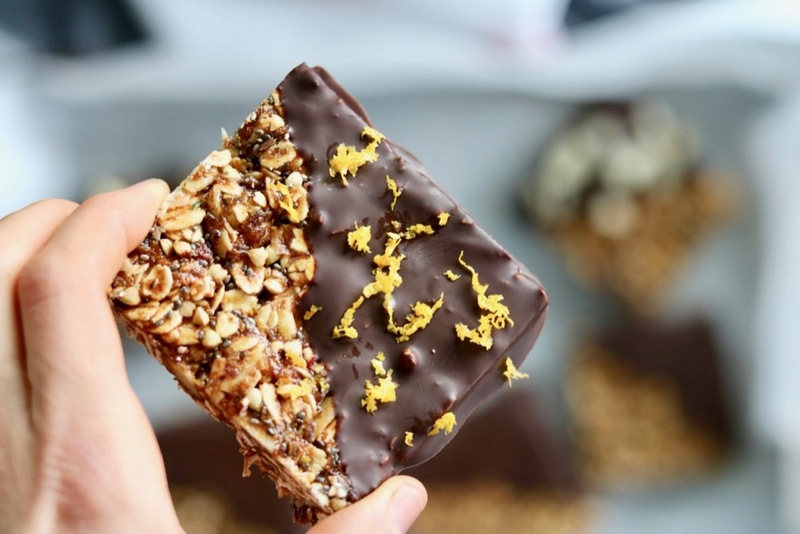 Naturally sweetened, filled with healthy ingredients and scented with the elegant combination of vanilla and orange - these granola bars will leave your sweet tooth satisfied anytime. They are the perfect mid-point between crispy and chewy so they will satisfy everyone's preference and if the texture doesn't do it, the chocolate coating certainly will. This recipe also makes a great base for different flavors - once you get the hang of the method and proportions you can easily omit and sub in the nuts, buckwheat, orange zest and vanilla and mix in your favorite flavors - like coconut, chocolate, cinnamon, etc. Toppings: sea salt, orange zest, almonds, goji berries, pumpkin seeds, cacao nibs, etc. 1. Preheat your oven to 350*F. On a parchment lined sheet pan, mix together the oats, buckwheat and silvered almonds - add to the oven and toast dry for 10-15 minutes or until lightly golden brown. Check often and toss with a spatula to make sure no over browning occurs. NOTE: If your almonds are already toasted, add them in after this step. 2. While the mixture is toasting, use a food processor to puree together the dates/apricots until there are no more large chunks of fruit and it forms into a mass. NOTE: I used a combination of dates and apricots for this recipe. If you do plan to use all apricots or another dried fruit (raisins and figs should work quite well), make sure they are quite moist. If you notice that they are a bit dry you can soak your fruit in boiling water for about an hour and drain before adding to the food processor - that should do the trick. 3. In a small sauce pan on low heat combine the wet ingredients - almond butter, maple syrup and pureed dried fruit. Break up the dried fruit and stir with a whisk or spatula until the entire mixture becomes well blended. Turn off the heat and add orange zest, vanilla, salt and cardamom. 4. When the oat mixture comes out of the oven, let it cool slightly before transferring to a bowl and add in the wet ingredients. Stir until well combined, then add the chia and flax seeds, stirring once more. 5. Re-line your sheet pan with parchment paper and spray lightly with coconut oil spray. Dump the granola mixture onto the pan and press it into a thin, compact, even layer with a spatula or your hands. TIP: To prevent a huge mess you can dampen your palms and fingers with water or coconut oil when pressing the granola into the pan - it will prevent the mixture from sticking to your hands. 6. For a toasted taste and crisp yet chewy texture, add the granola back into the oven for 15 minutes, checking often. When you remove the granola from the oven you want it to be golden brown and slightly darker at the edges. 7. Allow the granola to come to room temperature before moving the entire sheet pan to the freezer for at least a half hour (or overnight) to firm up. 8. When you're ready to slice and coat your granola in chocolate remove the pan from the freezer and use a sharp knife to cut the granola into the shape and size of your choosing (I opted for 12 large squares here). 9. Melt the chocolate and coconut oil together in a small sauce pan on low heat or in the microwave in 20 second intervals. 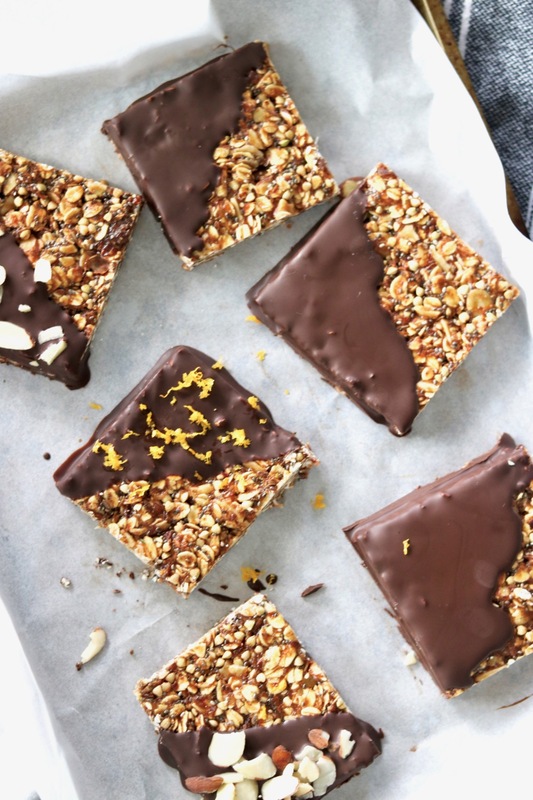 Once you have a smooth mixture, coat half or all of each granola square with the hot chocolate and place them on another parchment lined plate or sheet pan. 10. Sprinkle the chocolate coating with toppings if desired and then add the bars back into the freezer to set up for at least 10 minutes. These bars store well in the fridge or freezer for up to two weeks!